Graham has indeed come a long way in the past 90 years. P.W. Graham & Sons Construction started building small railway stations for the Canadian Pacific Railway in Moose Jaw, Saskatchewan in 1926. Over the years, Graham has widened its range of expertise to include all types of buildings, industrial and infrastructure projects. From schools, hospitals, and roadways to power plants, oil refineries and public transit, the company has earned a reputation for delivering any project, of any size, in any location. With headquarters in Calgary, Graham conducts business from 13 offices across North America. Graham was an early adopter of innovative information technology and was among the first to start thinking “green.” They continue to be at the leading edge of both software technology and sustainable construction practices. “We went from those early, meagre days to where we are today,” Corcoran said. “We’re doing about $2.2 billion (in annual revenue). We’re one of Canada’s largest contractors. We have about 1,300 salaried staff and over 5,000 trades people working for us. 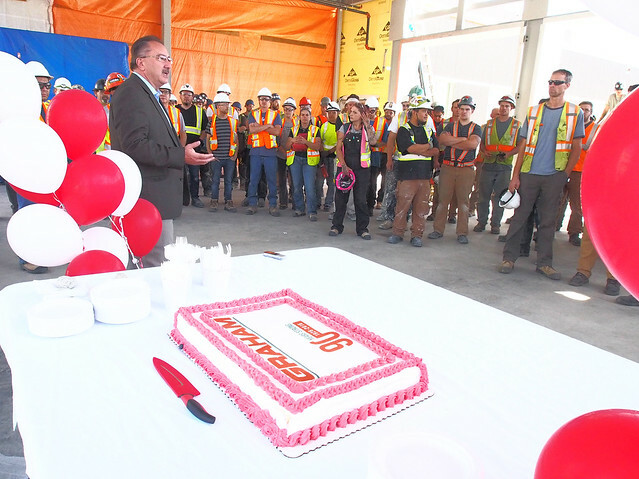 Corcoran said it was important to bring the ’90 Years Strong’ celebration to the North Island Hospitals Project construction sites. Tom Sparrow, NIHP Chief Project Officer, offered his congratulations to Graham.